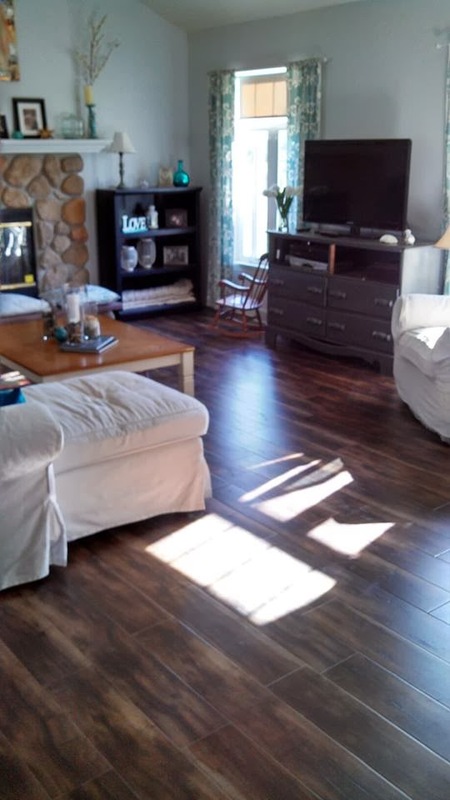 Wood floors, we did it! I love the way our house is coming along. I feel like it has become ours, we have put our own unique stamp on it. But there is one thing that I have wanted to change. The floors. We have what was once white carpet, never been changed in over 10 years. Professionally cleaned, but still, eww. Everytime I change something in our house I always envision what it would look like done. And always in those visions the floors are magically a dark hardwood floor. The paint in the living room and kitchen was picked to be light and airy for the eventual dark floors. The wainscoting in the hallway, all white and shiny I saw complementing my nonexistent wood floors very nicely. It was a “yeah one day.” kind of thought. Gorgeous, stunning, so pretty. A classic, rich wonderful look. But alas a not necessary thing that remained a dream. Then we dog sat for my in laws. They have a very sweet 9 year old Norwegian Elkhound named Thumper. During the long weekend we were out doing things most of the day on Sunday. Well when we came home there was a stench we could smell from the garage. There is no easy or lady like way to say this. The sh** hit the fan, literally. And the carpet in the living room, study and hallway. Everywhere, runny disgusting poop. We cleaned like crazy, scrubbed, did everything under the sun. There was still a smell and I was freaked out to walk on the carpet because I imagined… wonderful poo like things sticking to my feet and hanging out, contaminating everything. So after a few days of towels on the carpet on all the spots. We looked to a more long term and prettier solution. The first was get some big area rugs. But those are not cheap and it seemed weird to have rugs on top of carpet. Then the conversation of replacing the carpet in the living room, study and hallway with new carpet. Looking into that I had a hard time committing to anything because I knew I wanted to rip it all up and put in wood floors one day. 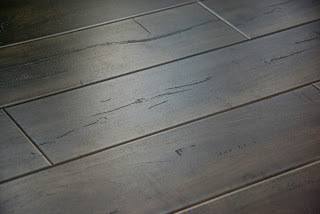 So after some convincing on my part we came to the conclusion that it was time to upgrade our flooring to wood floors! Yay! My husband wanted rustic, knotted, old cabin floors. I wanted dark, sleek, pristine floors. The things we could agree on was we wanted wide planks, and a beveled edge. I did not want the floor planks to easily run into each other looking like the linoleum we had in the kitchen. We wanted them to be obvious individual planks. And lastly we agreed on price, as cheap as possible without looking or feeling cheap. We wanted them to be sturdy and last a long time. Because it was sooner then we had planned we had less money saved for the project and knew any flooring we picked we would be installing ourselves. Installation costs are crazy! So a shopping we did go, on my birthday no less. Hey we already had the in laws watching the kids. So technically I got floors for my birthday! Anyways, we went to all of the main home improvement stores, all flooring shops and a wonderful place called Hobo. We found they had a great selection and really beat any other place cost wise. The problem was finding a median for both the Hubs and I when it came down to the nitty gritty of selecting THE ONE. 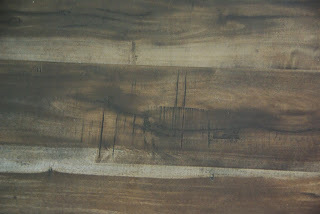 We came to a compromise of dark, distressed wide planks. See a little him and a little me. Then we looked for all kinds, laminate, bamboo, oak, walnut, some peel and stick stuff. Once we narrowed it down we had to find ones that they had enough of. We were going to put flooring in our living room, study, kitchen, dining room, hallway and our tiny entryway. I love the idea of hardwood floor throughout. I would put it in bedrooms too but my husband wont even hear that notion. He wants plush carpet in those rooms. 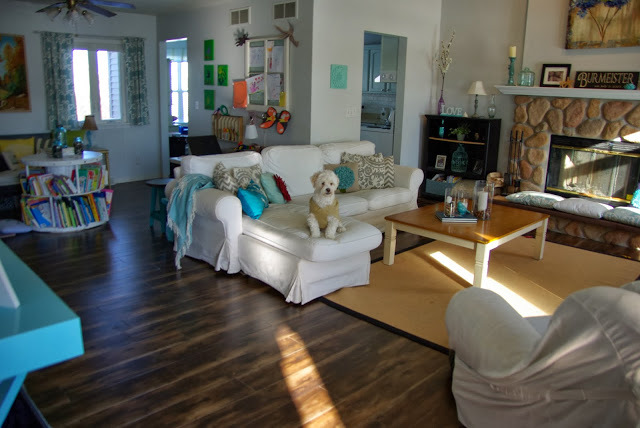 The total was 1300 square feet of wood or laminate flooring in the main living areas. We needed about 60 boxes depending on how many square feet per box. So with that we were limited on choices. Hobo cannot order more, what you see is what you get. They are a store that takes the left over, clearance or discontinued things. Which is why the price is so great. So after walking around, discussing, fighting (lovingly), thinking, brain storming, walking around with a few different samples we came to one we loved. It was us. But they only had 32 boxes. We kindly asked an employee if he could somehow magically make 28 more boxes appear. We did have a choice number 2 which they had enough of. The employee said “go with your gut”. Our gut was short half the boxes. Then he did perform magic and found there was another store in Illinois that had what we needed. We could take the 32 home that day and pick up the rest later. Victory! We paid for both, having buyers remorse the second the total was said out loud. Eeek! That was a lot of money! 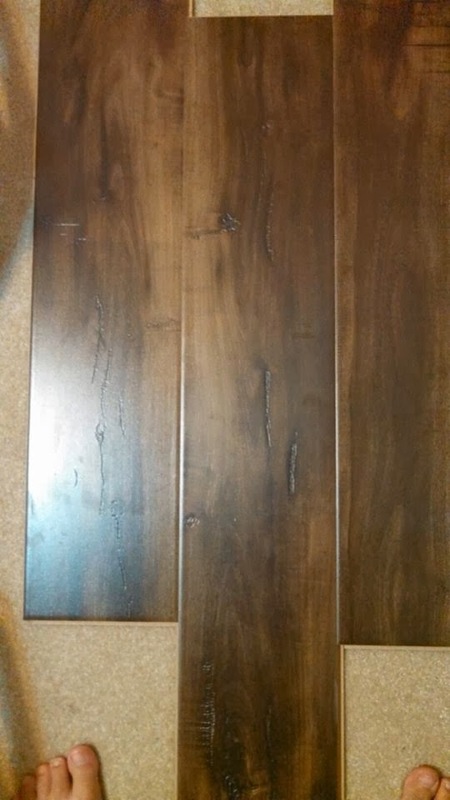 (Although not an ounce of remorse now that the floors are in, worth every penny) My husband reluctantly paid the balance, with plans to pick up the remaining order in 3-5 business days. We stuffed and rearranged the boxes into our car. It is a good thing we could only get half, our wonderful van was filled to the brim as is. Our choice was a laminate with the mat for sound proofing and making them softer to walk on attached to the underside. It has been a few weeks since we installed them. I love them, we found some rugs that will work for now in the couch area of the living room and in the kitchen. Until we can find the perfect one or pay to have one custom made they will do. The kids love pushing their cars across the floor. Or sliding down the hallway with socks on. I love the look. To me it makes my house feel warmer. We have a lot of light colors and it brings the tone of the room down, grounds it a little. It also feels bigger in the house because of the same flooring throughout the main living areas. I will explain with the installation post about the tests we did to make sure the floors could withstand moisture in the kitchen. But for now I think I have talked/typed enough. Now I am going to slide down my hallway in socks, it is not just fun for the kids! I will show you pictures of the process as well as the steps taken in a another post coming up. 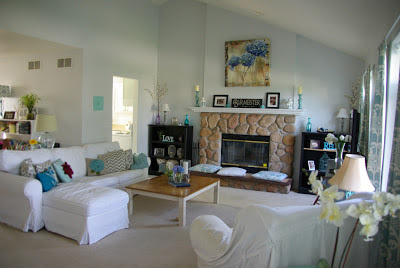 But here to tide you over a little is before and after pictures of the living room. I love this! everything is so fresh and white with great splashes of color–and the floors are to die for! thank you so much. I love the floors more and more everyday! Where did you buy the laminate flooring from?